The lending space in Fintech is booming in India and around the world, with startups using machine learning and AI to better gauge the credit worthiness of an individual. Information from social media, text messages, and even location specific data from google is used to better understand customers by lending firms. Most lending firms target the middle class or even upper middle class of society, hence they are able to get accurate data through peoples’ mobile phones. Peer to peer lending is growing as an asset class in India with better KYCs enabled through the India stack APIs and Aadhaarnumber. Most traditional banks as well as emerging fintech players target the so called India-1 and India-2 who are the lower-middle to upper class. But for those in the poorer sections of society and for those in the rural areas with less internet connectivity, getting a loan from a bank is very difficult, let alone an accurate credit score. 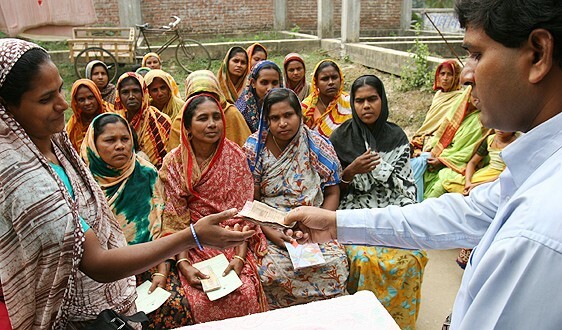 Microfinance institutions lend to this low income group segment through the grameen bank framework pioneered by Mr.Yunus. This framework uses lending circles and peer groups to loan money and enhance recovery of loans with a majority of loans given to mothers. Microfinance institutions often get their capital from banks. Their margins are on the higher rate of interest given to the low income families. The rate of interest is higher due to higher risk of default and large costs associated with loan recovery, sometimes to the tune of 40% of the interest charged on the loans. In India, microfinance has played an important role in farmers securing financing for their land. However, critics of microfinance show that due to increased pressure to show profits, MFIs give out a large number of loans without a proper credit check and use coercive methods to recover, which has lead to farmer suicides. Lending to a peer group in India through a MFI representative. What we’re proposing is a Microfinance solution on Blockchain. The loan is given to a lending circle/microfinance institution, they are the credit scorers who determine the credit scores for the lending circles. The money is repaid back to the microfinance institution and then they in turn pay to the lender. This could go a step further where the lender directly lends to the peer group, but credit scoring the peer group and ensuring accurate payback is a difficult task. The advantage of a Blockchain is that anyone can act as a microfinance institution (MFI), a lender, or a borrower. Borrowers register with a MFI, the MFI credit scores the borrower, and lenders give out loans to the MFI who are then scored by the lender. Hence in this system, we have a reputation mechanism for borrowers, MFIs, lenders. Once the system is up and enough loans are given out, these loans can be securitized and sold to investors. Based on this concept, we have created a Proof of Concept and deployed it to the Ethereum Testnet here — http://159.89.175.20. In the PoC that we’ve designed, there are no peer lending circles. There are separate accounts for MFIs, lenders, borrowers. All transactions whether it’s borrowing/lending/paying back are recorded on the Ethereum testnet. However, to enable such a system to work in the current scenario, there needs to be an easy way to convert any kind of crypto into fiat, that’s why we propose to use either the Stellar or Ripple Blockchain for such a system. Hence, if this kind of system is to be implemented and used, it would have to be built on the Stellar or Ripple Blockchain, hence lenders can provide Stellar or XRP, and that would get converted to Fiat through their partner banks, which then comes into the MFI and reaches the borrower. Founder at wandx.co. Ironman finisher.